UPDATED: The 13-year-old Qaryut boy attacked by settlers on 16 May completed an operation on his lower leg and foot on Friday and has since been released to recover at home. He also provided a full account of his attack and the time he spent in an Israeli jeep untreated and tortured for information he neither had nor could speak of due to the pain from his untreated injury. The boy said he was alone on his land near the illegal settlement of Eli when he was attacked. His friend was coming to join him when settlers began shooting at the boy. He ran, but fell from a big drop in the land, being on the mountainside. Settlers pursued him but he dragged himself on his stomach by some bushes. He was in great pain but kept quiet, afraid of settlers or soldiers finding him and continuing to attack him. After some time, his phone rang when his sister and friend called him. The soldiers then found and descended on him, threatening him with their guns while he lay, unable to move, on the ground. Below is video of the boy’s harassment when the Israeli soldiers found him; the video is taken in the village area down the mountain from the nearest illegal Eli settlement houses, in view of the land where the boy was attacked. He said that the soldiers and settlement security official (DCI) threatened to kill him. No one from the village could come to the boy’s aid for risk of being shot at by the soldiers. Local Red Crescent representatives said that a man from the municipality was with the soldiers and was told that the boy would be treated in an Israeli ambulance and possibly taken to an Israeli hospital. However, as the Red Crescent, the boy’s family, solidarity activists and nearby villagers waited, watching the soldiers on top of the mountain for two to three hours, the boy was untreated and tortured by Israeli army officials for information. “They said I was trying to set fire to the land by the settlement; they said I was with three others and had a lighter and a firebomb,” the boy said. “They would twist my leg every ten minutes or so when I would not give them names [of those with whom he was accused of conspiring].” The boy said he was also beat for information. Finally, the local Red Crescent brought an ambulance to the entrance of the illegal settlement where they were given the boy, untreated. The boy’s grandfather said that his grandson’s flesh near his ankle was open, his leg wobbly, and black flesh showed from the boy’s yet untreated injury. 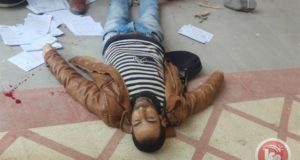 The Red Crescent immediately took the boy to the nearest hospital in Nablus: Rafedia hospital 30-45 minutes away. The area of the boy’s attack has seen several settler attacks on the nearby houses. Most notably, settlers from Eli have several times in the past year set fire to Palestinian olive trees near the house Im Fayyiz, a woman known in the village for her long-time struggle with attacks by the nearby settlers. Qaryut also suffers from a key road-closure of a road leading to both Nablus and Ramallah. Previous peaceful demonstrations to open the road, however, have ceased due to fear of more arrests, as 15 innocent Qaryut villagers, mostly young men, were arrested in the past 5 months for peaceful activism in taking part in the demonstrations. 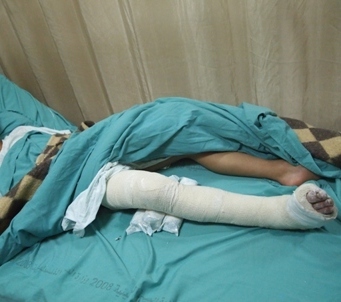 At about 2pm on 16 May, a 13 year-old boy was shot at and beaten by settlers and soldiers; he broke bones in his leg running from the shots at him and from being beaten. After falling, the boy was threatened with his life by settlers, but soldiers arrived and stopped the settlers from killing him before threatening the young boy with three guns while he lay injured and immobile on the ground. 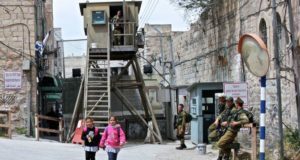 Initial medical attention was not allowed during the time Israeli soldiers had taken the boy into their custody, implying that he would be treated in an Israeli ambulance. However, three hours later, the boy had to be picked up, untreated, by the Red Crescent and taken to Rafidia hospital in Nablus. When solidarity activists saw the boy, his entire right leg was wrapped in a cast. 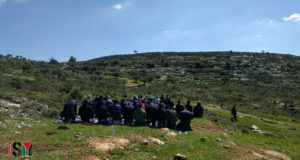 Later he described that he was sitting on his land which is close to an illegal Israeli settlement bordering Qaryut and famous for attacks such as olive tree torching. Settlers shot at him and he ran from the shots. When he fell, the settlers beat him and were going to kill him, but soldiers arrived and told the settlers could not. Afterwards, the soldiers also shouted at the boy with guns pointed at him. 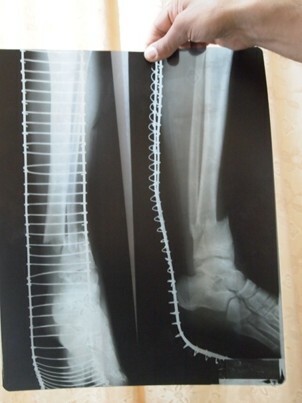 The boy may undergo surgery for his broken bones. Just two days before this attack, Qaryut faced an olive tree torching attack from another nearby illegal Israeli settlement and the village has a history of well-documented settler attacks on its land. In addition, Israeli military have closed a Qaryut road to Nablus and Ramallah for Palestinian use as the road is not far from illegal Israeli settlements on Qaryut land. Currently, 15 mostly young Qaryut men have been arrested for activism in peaceful demonstrations against the key road’s closure.